A New York court ruled in favour of the defendant, the Union Carbide Corporation (UCC), finding that the company could not be sued for ongoing contamination from the chemical plant. 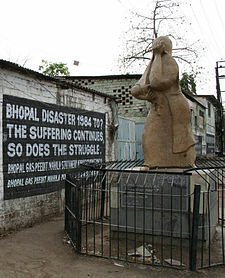 The Bhopal Gas Tragedy, considered India’s worst industrial disaster at Union Carbide India Limited (UCIL) due to the leakage of methyl isocynate had caused irreparable loss to mankind and nature. It killed over 5,000 people and had adverse affects on the nature. The First Sahu ( Sahu I)case was filed in 2004, seeking personal injury claims. In November 2006, the District Court for the Southern District of New York granted summary judgment to the defendants, finding them not liable for damages alleged. however the second court reversed the judgement on grounds that the trial court did not provide the plaintiffs notice that it intended to rule based upon the limited evidence that was before the court, and sent the case back down to the District Court for further proceedings. The Second Sahu (Sahu II) case was filed in 2007, seeking property damages. Plaintiffs are different in both the cases, however the claims made were similar the District Court granted the plaintiffs’ motion to stay Sahu II in 2007. In 2012, the District Court once again granted summary judgment to the defendants in Sahu I. The plaintiffs appealed to the U.S. Court of Appeals for the Second Circuit, and the Second Circuit upheld the district court’s dismissal. After the Second Circuit’s order, the Court dissolved the stay in Sahu II, and UCC moved for summary judgment arguing that Sahu II should be dismissed on the same grounds as Sahu I. The Sahu II plaintiffs opposed that motion, presenting evidence of UCC’s responsibility that was not before the Court in Sahu I. In particular, plaintiffs presented the declarations of two eminent waste disposal experts, who show that UCC’s manufacturing design and “high risk” waste management strategy caused the pollution. Plaintiffs also submitted the declaration of L.J. Couvaras, who was the Project Manager for the construction of the plant, as well as that of a UCIL employee, both of whom demonstrate that Couvaras was a UCC employee when he oversaw and approved all design done in India and construction. This shows that UCC had final authority over all design, including of the waste disposal system. While the plaintiff’s said that they were “confident that evidence surrounding Couvaras’ role will lead to a reversal of the erroneous decision on appeal,” Judge Keenan further ruled that the Government of Madhya Pradesh would also not be held liable for a clean-up of contamination at the site of the disaster. The plaintiffs intend to appeal Wednesday’s decision and the Second Circuit Court of Appeals, which will hear the appeal, has previously reversed several prior dismissals of cases against UCC. Judge Keenan said UCC’s former CEO Warren Anderson was not individually liabile because he did not personally approve the location of the Bhopal plant. Previous ArticleResearch Methodology Course in Social Sciences organised by Vallabh Government College, Mandi in association with MHRD (ICSSR), Government of India, New Delhi.